1 of 4 Sprinkle pork with 1/4 teaspoon of the pepper, the garlic and 1 tablespoon of the rosemary. Cover and refrigerate 2 hours. 2 of 4 Prepare a charcoal grill with medium-hot coals or heat a gas grill to medium-high. Coat the grill rack with nonstick cooking spray for grilling. Brush onion and peppers with 2 teaspoons of the oil and grill, turning often, for 8 to 10 minutes, until lightly charred and crisp-tender. Cool vegetables slightly and chop. 3 of 4 Whisk vinegar, honey, remaining 1/4 teaspoon pepper, remaining 2 teaspoons rosemary and 1/2 teaspoon of the salt in a large bowl. Whisk in remaining 2 tablespoons olive oil. Add chopped onions and peppers. Set aside. 4 of 4 Sprinkle pork with remaining 1/2 teaspoon salt and grill, turning often, 20 to 25 minutes or until internal temperature registers 160 degrees F on an instant-read thermometer. Let stand 10 minutes before slicing. 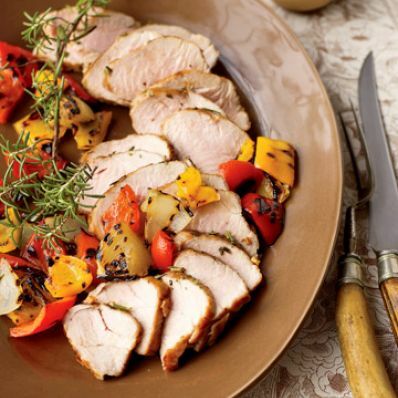 Serve pork with relish. Per Serving: 642 mg sodium, 2 g fiber, 275 kcal cal., 29 g pro., 12 g Fat, total, 13 g carb., 2 g sat. fat, 67 mg chol.